We review the cooperative game Castle Panic. 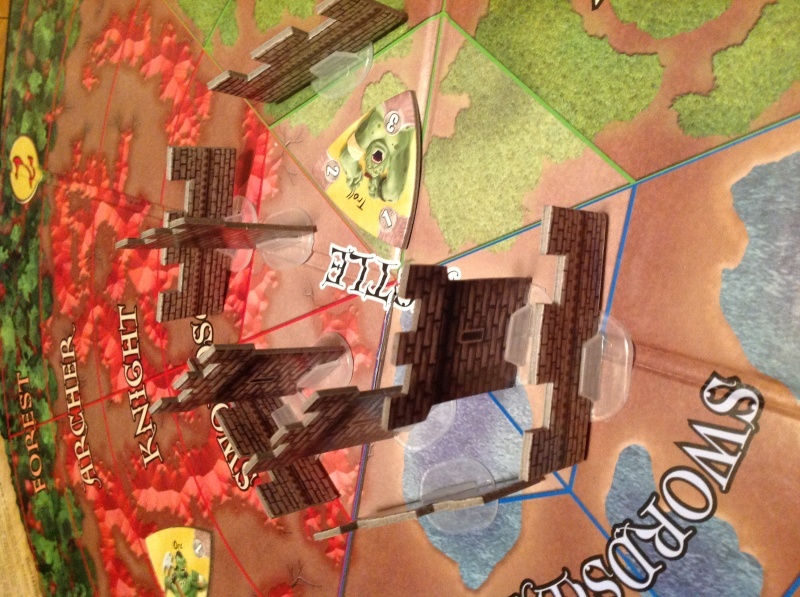 Players must work together to defend their castle from the advancing monstrous hordes. With some easy to learn rules and quick game play, Castle Panic is a great entry to the cooperative genre. Being a person that has played Dungeons and Dragons over the last 5ish years, I have fought my share of mythical monsters. From beholders to storm giants to gelatinous cubes, have fought in the more difficult battles at the end of a long dungeon crawl. On the way to fortune and glory, you first encounter much easier enemies. Some of the most popular monsters to fight are goblins, orcs and even trolls. Well, they have had enough and have found your castle. These monsters are now gathering an army to take it down…or at least that is what I think is happening in the board game Castle Panic. Castle Panic is a cooperative game where players must stop the advancing horde from destroying the castle. Will this game be victorious or fall victim to the monster army. Lets find out. Castle Panic is a cooperative game for 1-6 players that plays in about an hour. Castle Panic plays well with any number, but best with 4 players. Each monster will be in an arc which will note which color and troop card can hit them. 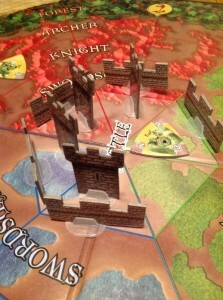 Castle Panic starts with a castle set in the middle of the game board. The land around the castle is separated in three colored areas, divided into 3 arcs with 3 rings inside of each. These rings represent the type of card that is needed to inflict damage to a monster in that colored ring. 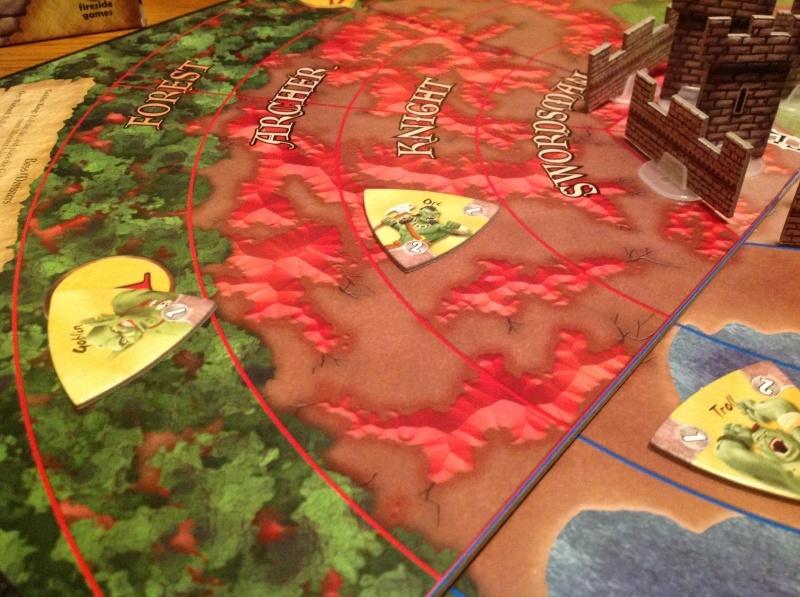 Archers, knights, and swordsmen are only able to inflict damage in the specifically marked rings on the game board. Players will need to have the right cards in their hands at the right time to stop the monsters from getting too close to the castle and destroying its walls and towers. At the end of every turn, more monsters will appear in the outskirts of the castle. Players will also have to deal with special tiles that can cause movement of monsters, special boss monsters, or even giant boulders that destroy everything in their path. If players can keep at least one castle tower standing after the last of the monsters have been killed, they will will the game. Overall, the components are of solid quality in this game. The artwork is a medieval style that fits with the game’s theme. The game board is smaller than typical boards, but everything is well spaced out and never feels crowded. I particularly like the fact that the tiles have numbers on the tips to show the current hit points of monsters on the board. It’s a small touch, but saves us from putting markers on these pieces to show damage. I also want to draw attention to the manual. They took their time with this book to make sure that every question that might come up is answered. It makes the game very easy to learn and is one of the best I have seen. Players will have hands of cards which will decide which monster tiles they can attack. Draw up to your 5 card hand limit. Players will draw to the hand limit at the start of their turn. This allows for players to have more options at the start of their turn. Players may discard a card that is of little value to the team right now in hopes of getting a card they can use or trade to another player. 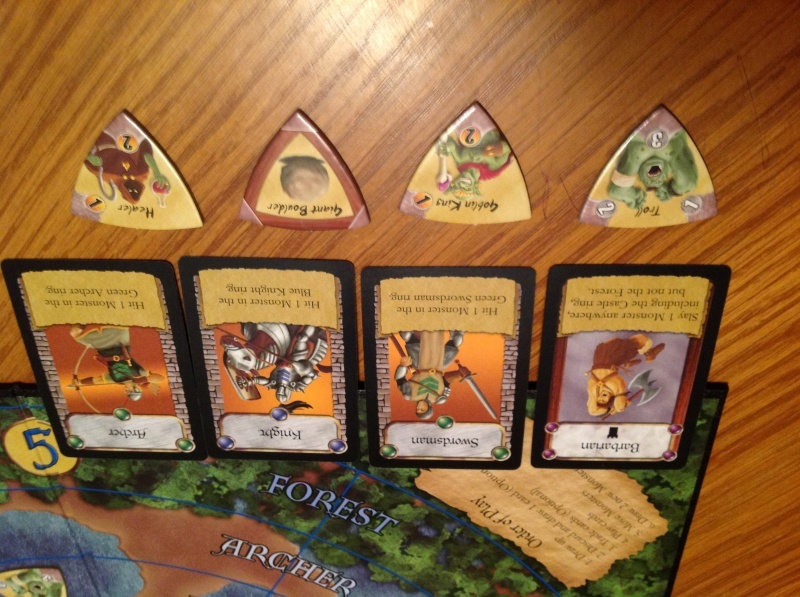 A player can trade cards with other players to improve his or her hand. 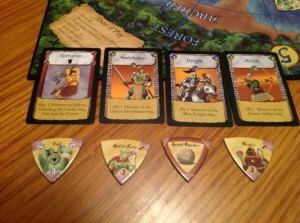 Unless you are playing with 6 players, each player may trade only one card with one other player. A lot of discussion and planning goes into this phase to try to optimize everyone’s turn. Each player can play as many cards as they can out of their hands. These cards may be used to attack monsters, build walls and fortifications or slow down the movement of monsters. When a player attacks a monster, they must have the right color archer, knights, or swordsman to hit the monster in that area. Several cards can attack any monster anywhere or kill a monster outright. A few of these cards have little castle symbols on them and can be used when a monsters gets into your castle. Monsters who survive the onslaught by the players move up one ring on the board closer to the castle. When a monster gets into the castle ring in the center of the board, they move one space clockwise. If they run into a wall or castle, the piece is destroyed and they take a hit point of damage. If this drops them to zero, they are taken off the board. Players will draw two more tiles and roll a 6-sided die to determine which colored arc the monster will come from. There are also some special tiles in the mix to keep players on their toes. Play will continue until all the monsters tiles are out of the supply and have been killed. If all 6 of the player towers are ever destroyed, the games ends and the players lose. The monsters will slowly advance on your castle. As the damage the castle, the pieces will be removed. 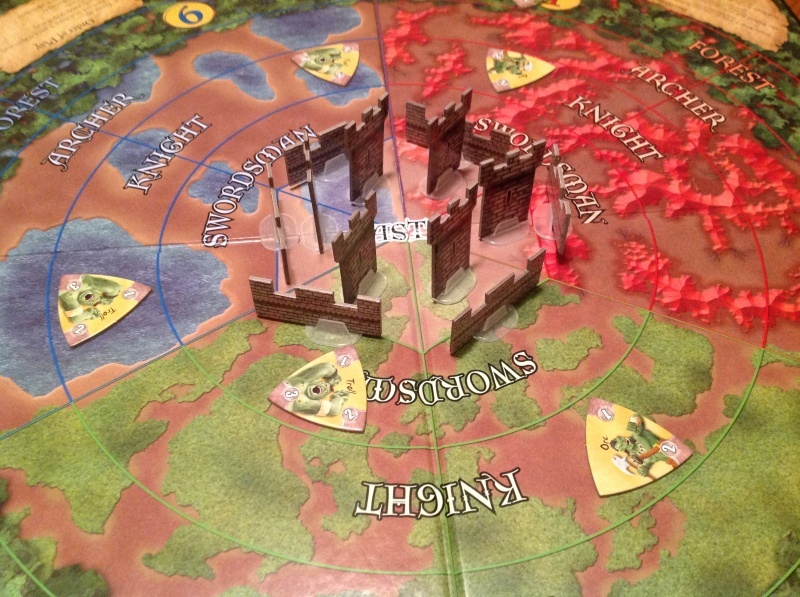 While playing Castle Panic, it’s clear that it’s more simplistic game. I enjoy Pandemic and there are a lot of very difficult decision to make during that game while trying to save the world. In this game, it’s very clear what you have to do: stop the monsters closest to the castle at all cost. It allows the players to see a clear goal and work together to complete it. I don’t know if it’s just the groups I have played this with, but there always a few tense moments in the game. Where one of the boss tiles gets drawn and its special ability gets activated and it looks like all hope is lost as the army gets closer to the castle. In most games, we are able to fight them off and survive with only losing some of our defenses, but the game is so much fun during those tense times. Unfortunately, if there isn’t a massive amount of monsters on the board, the game kind of slows down and becomes less enthralling. The pacing in Castle Panic just isn’t very consistent. If a monster makes it into your castle, they become a lot harder to kill. I do love how the board is set up. With the different colored sections, each with the different rings, it make the game a little bit of a puzzle to make sure that players will have cards in their hand that can be used to kill or injure monsters. You have to think a couple moves ahead to try not to get yourself into a difficult situation. The game makes sure that everyone gets involved on his or her turn by trading a card to another player. Even if you don’t have anything in your hand that can help on this turn, someone else might have something you can play. This allows every player to contribute to the game on their turn where in other games you might be stuck doing nothing. I also have to mention one of the coolest features in the game, the giant boulder. When this tile is drawn a massive boulder is thrown at the castle. A die roll is used to determine the direction the boulder comes from. What makes it fun is it only stops when it runs into a castle wall or tower, which can be devastating, but it also kills all monsters in its path. We have had it go through our castle space late in the game, through missing wall and tower pieces, and taking out at least 5 monsters in its path. You might have to sacrifice a tower or wall, but to have a whole area cleared of monsters isn’t a bad thing. My major criticism of the game is that it is a little too simplistic for my tastes. I feel that sometimes the game is too clear on what to do. There aren’t many decisions that need to be made in the game outside of what to trade. When you play cards on your turn, you will want to play everything you can because it all helps. There is plenty of randomness with this game when the tiles are drawn, but every time they come out on the board you will have 3 rounds to make adjustments. Very rarely are you blindsided by something. As I said earlier, there is tension in the game and the special tiles can make the game very difficult to win, but I don’t feel like my brain is working overtime while playing the game. I want to be clear that I enjoy playing this game and will keep it in my collection. However I feel that pacing is sometimes slow and the game is almost too simple for my tastes. Yet Castle Panic it is so easy to learn and play that it makes a game great for first time players into the co-op arena. Castle Panic is also perfect to play with the younger gamers in your family. My kids are not old enough to play this game yet, but I will keep it until they can. Every time I have played this game I have had a fun time playing it. 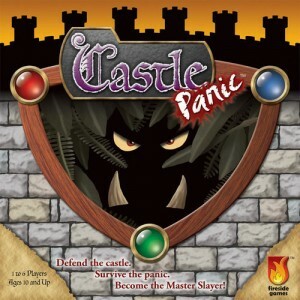 If you haven’t tried it, you should give Castle Panic a try. Just watch out for the boulder. Final Score: 3 Stars – A simple co-op game that will be enjoyed by families. I’ve been following on twitter for a while, first time on the blog. Excellent write up. I am looking forward to reading more reviews. Every game I play of this is house ruled. One of the best things about it is how easily the rules can be adjusted, especially with the expansion pieces available. I have about 3 different abilities for the bosses depending on how well we’re doing. I basically set myself up as dungeon master- intent on choosing the tiles and cards and changing a few predecided variables along the way to try to come up with the closest margin of victories possible. Every game can be exciting. I play with kids too so I actually combine phase 2-4 so they play faster- this gives stronger hands on average but the difficulty can be made up elsewhere. We have this game and it does play well with children. I definitely recommend it if you have kids around ages 7-12. If you are looking for a more difficult version, add the Wizard’s Tower expansion. Your castle gets a Wizard Tower which allows you to cast spells, until it is destroyed that is. The expansion also adds some very tough monsters and special abilities including a five-hit dragon that catches your walls on fire, weakening them. This expansion drastically increases the difficulty of this fun family game. My kids and I used to almost never lose this game, since adding the expansion we regularly have our butts handed to us. Looks and sounds very similar to Kontakt!